First aid is the assistance given to any person suffering a sudden illness or injury, with care provided to preserve life, prevent the condition from worsening, or to promote recovery. It includes initial intervention in a serious condition prior to professional medical help being available, such as performing CPR while awaiting an ambulance, as well as the complete treatment of minor conditions, such as applying a plaster to a cut. 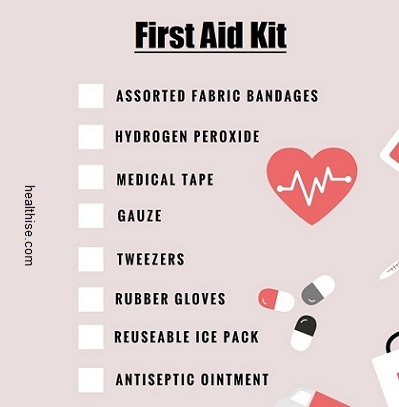 First aid is generally performed by the layperson, with many people trained in providing basic levels of first aid, and others willing to do so from acquired knowledge. Mental health first aid is an extension of the concept of first aid to cover mental health. The basis of first aid training is “prevention”. It is always better to be safe than to be sorry. Knowledge of first aid promotes the sense of safety and well being amongst people, prompting them to be more alert and safe in the surroundings they dwell in. Awareness and desire to be accident free keeps you more safe and secure, reducing the number of causalities and accidents. If a person who is trained to give first aid administration happens to see any casualty in his vicinity, immediate action can be taken and lives be saved. While it is natural for most of us to rush to support any injured person, a trained person is more reliable, confident and in control of himself and his actions while in trauma situations. Some injuries require a very simple solution like applying ice pack or a quick rub. A ride to the emergency room is not necessary, at least not for some time. In such cases, calling a person trained in first aid courses is more reliable. They can help reduce the pain by performing simple procedures and can help relieve pain at least temporarily. Knowing that you can save your own life when required, or that of the people you know or those in trauma during some emergency helps you relax more and be more secure. The sense of security promotes a healthy and a more confident environment around you where you and the people around you would feel more secure. The presence of such people provides reassurance to the others in the situation. A first-aid trained person would know how to keep the situation from becoming bad to worse. They will provide temporary treatment which will keep the condition of the victim from deteriorating, till professional help arrives.